Summer Lingerie Part 4 - Evie la Luve Darcey and Binky again! Not sure what I would get out of the scraps I first cut the pieces for the Binky and decided how to finish once I worked out what bra I could make. So it ended up being the Darcey Style 3 and Binky Style 5. Has I had fussy cut the last two sets I had quite a lot of small pieces left so it was hard to find enough to make a bra after using the last two big pieces for the Binky. The purple contrast had worked so well with the Romy that I thought I would try the mesh Darcey version, reducing the amount of fabric needed. This used up most of the purple fold over and I had already used up my supply of navy. So I used the ice blue for the waist and decided to try the narrow lace for the leg of the Binky. First up was the Darcey. The curve of the mesh looks daunting but as with every Evie la Luve pattern the pieces went together really well. What I would say is make sure you mark ( I never snip) the notches accurately and make sure they match as this ensures the proper placement of the curved pieces. As the mesh is dark I did grade the seam allowance to ensure it was tucked between the lighter layers. Then I pressed over a tailor's ham. 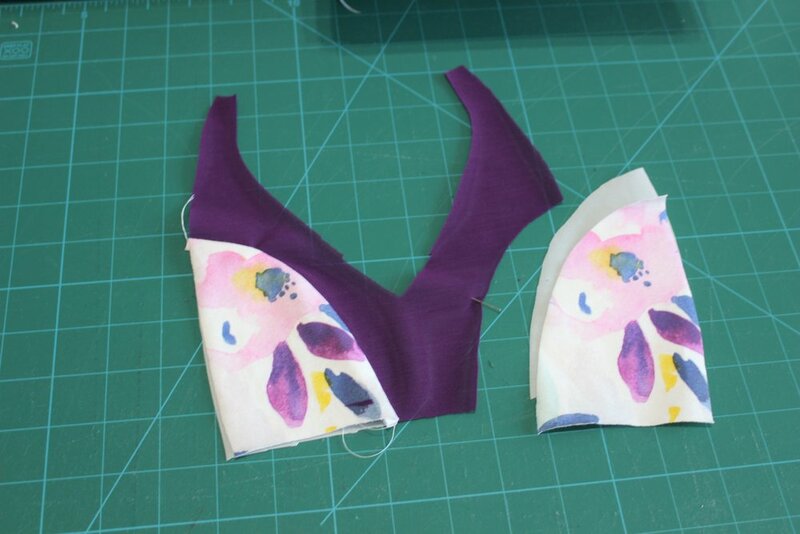 The bra is then finished as Style 1. The centre front piece is enclosed by the side fronts fabric and lining. Again grading the seam allowance and pressing using the tailor's ham. The side front is then enclosed by the back band fabric and lining. The next step is the first pass of the band elastic. 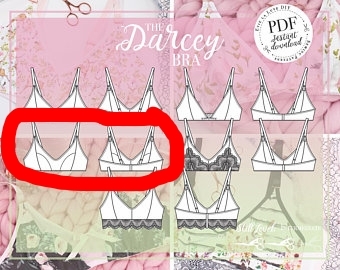 The back straps are then attached to the inside of the bra on the band elastic. So when the band elastic is folded back for the second pass the straps are neatly enclosed. This is such a neat method. Then the fold over elastic is applied to the neckline. 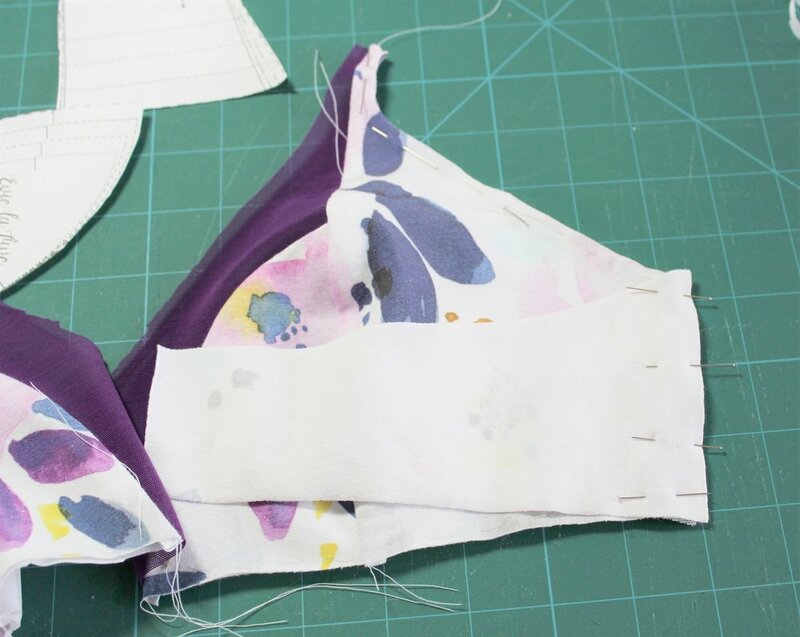 As always, before applying to the top edge of the bra, you check the back band fits into the fastener. I shaved a small amount of, with both sides together, so they match. Guidelines are given for the length of elastic and this works pretty well for me. The point I would make here is to make sure you mark the centre of the elastic for the V of the neckline so evenly matched on both sides. The inside of this bra is as good as the outside. Then on to the Binky. I thought I would finish the leg with some narrow lace. I have done once before on a Frankie and it turned out pretty good. I had forgotten what I a time consuming method this is. You pin the lace along the edge of the lace on one side and then mirror on the other side. I did not baste but went straight to sewing as the lace was not moving around on the fabric. Then I used a small zigzag all around the inner edge of the lace which is a lot of lifting of the presser foot for an even curve! The next step is to trim the fabric close to the stitching. This is where applique (duckbill) scissors come into their own, I have two different sizes. I did most with the larger pair and then went to the smaller pair for any tight turns. I did use white bobbin thread so you can hardly see the stitching. Then a perfect match on the side seams. I certainly got value for money with a yard of fabric! I certainly got value for money with a yard of fabric!